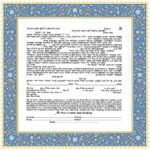 A Victorian blue border surrounds a simple vine of petit flowers gently floating around the marriage vows. Gold accents highlight the fanciful flowers. 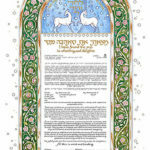 A potpourri of color, texture and coolness, this ketubah is a fanciful and optimistic rendition of Jerusalem. 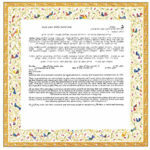 Doves playfully surf in, out and around Jewish symbols and quotes from the Song of Songs. 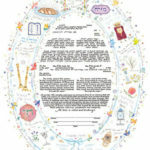 Jewish symbols, life cycle events & holidays, and traditional quotes are interspersed throughout an ethereal oval that encompasses the marriage vows. The folk motif influence is evident in this light and airy creation. 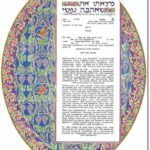 (This ketubah has no gold foil). 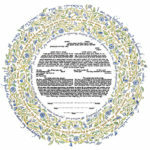 Tiny, delicate flowers embellish a rich cobalt blue background to create a stylistically simple yet harmonious ketubah by Mickie Caspi. Opulent with gold foil accents and an elegant golden trim. 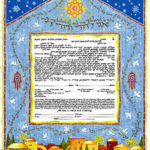 The word Ahava means love in Hebrew. Two exquisite, stylized gazelles symbolize mutual love and devotion. 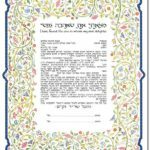 Delicate flowers and Stars of David surround the wedding vows. 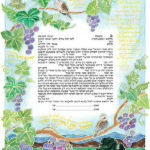 A rich border of pomegranates surrounds a lush vineyard, which in turn encompasses the text of the ketubah. Strong gold foil accents complete the oval and highlight the imagery. 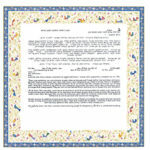 Two turtledoves representing devotion and faithfulness, are perched on grape vines, symbols of peace and abundance. 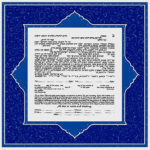 Quotes from the biblical love poem, the Song of Songs, are delicately written in gold foil calligraphy.